"We would like to develop our role as an arts venue including further opportunities for artists to use the space as a place of experiment, exploration and discussion"
Victoria Baths is a space full of potential. Everyone who visits the building knows it – those who swam here, those who envisage a bright future, those who are intrigued by its past; those who understand the architecture, the social history, the importance of swimming and looking after the body, those who simply come to see. Artists have certainly seen potential. Potential in the vast pool spaces and the hidden depths; potential in the memories left behind; potential in the social and political context; potential in the dark basements and the leaking glass roofs – potential in the people who pass through. Potential that has been explored to produce some fascinating art work. We recognise that artists have played an important part in keeping the building alive over the past twelve years. We recognise that without their work, the journey to save Victoria Baths could have been drier and darker. At the most difficult times, artists’ responses to Victoria Baths have inspired us not to be disheartened by the slog ahead or fed up about the past - gone forever, but instead to focus on the here and now – to celebrate, reconsider and look again. 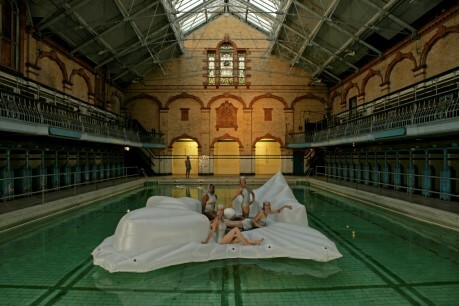 We believe that Victoria Baths has made a distinctive contribution to the arts in Manchester by providing a unique and changing setting for arts activities with links to a variety of audiences. As Victoria Baths enters the next stages of its evolution, we would like to develop our role as an arts venue including further opportunities for artists to use the space as a place of experiment, exploration and discussion. We want to do this in partnership with other arts organisations, local, national and international artists and local communities.